Could you believe it’s still possible today to buy a new car that gets only 9-MPG? Believe it, it’s real. 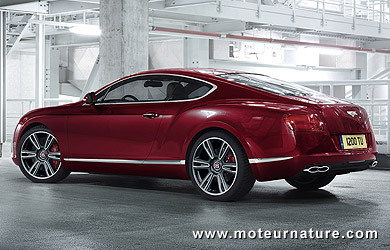 That’s what a Bentley Continental GT gets in the European city driving test with its W12 engine. This can’t last. It has to get better. A Lexus LS600h, which offers an excellent level of luxury, though not as impressive as the Bentley, offers fuel economy that is twice better. So we guess that Bentley could have chosen to develop a hybrid drivetrain to make its Continental model more fuel-efficient, but it chose the more classic downsizing way. The 560-hp twin-turbo 6-liter W12 engine will get a companion in the form of a 507-hp 4-liter twin-turbo V8. Power is slightly down, but torque is up, from 479 lb-ft in the W12 to 487 lb-ft in the V8 with a flatter curve. Quite incredibly, torque is constant from 1700 to 5000 rpm. We guess some users may not notice there is a smaller engine under the hood, but they will see the improvement at the gas station. Fuel economy should be better by some 40%. This huge improvement comes from the use of a better transmission with 8 gears (of course, it’s an automatic), that smaller engine with more tech than the bigger one (high pressure direct injection, low friction bearings, smart thermal management), and something never seen on a Bentley before: a cylinder deactivation system which can turn the V8 into a V4 on partial loads. A highly sophisticated engine management system should allow this to happen without the driver’s noticing. The only worry should be about the sound from the V4, but engineers have worked on that. 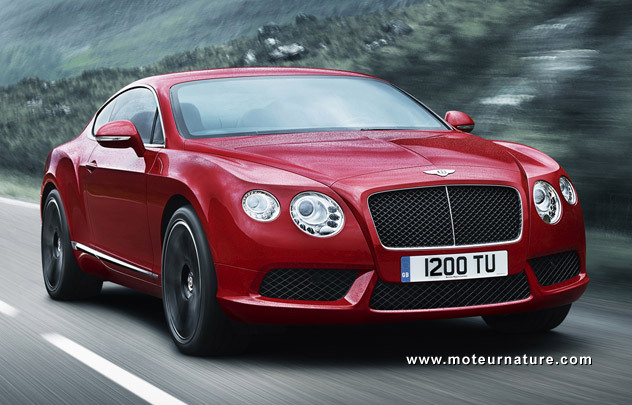 Combined fuel economy should be about 22 mpg, which will give the Continental GT V8 the title of the most fuel-efficient Bentley ever. Greenies will see it as a major evolution of the species: this is the first Bentley you couldn’t call a dinosaur.